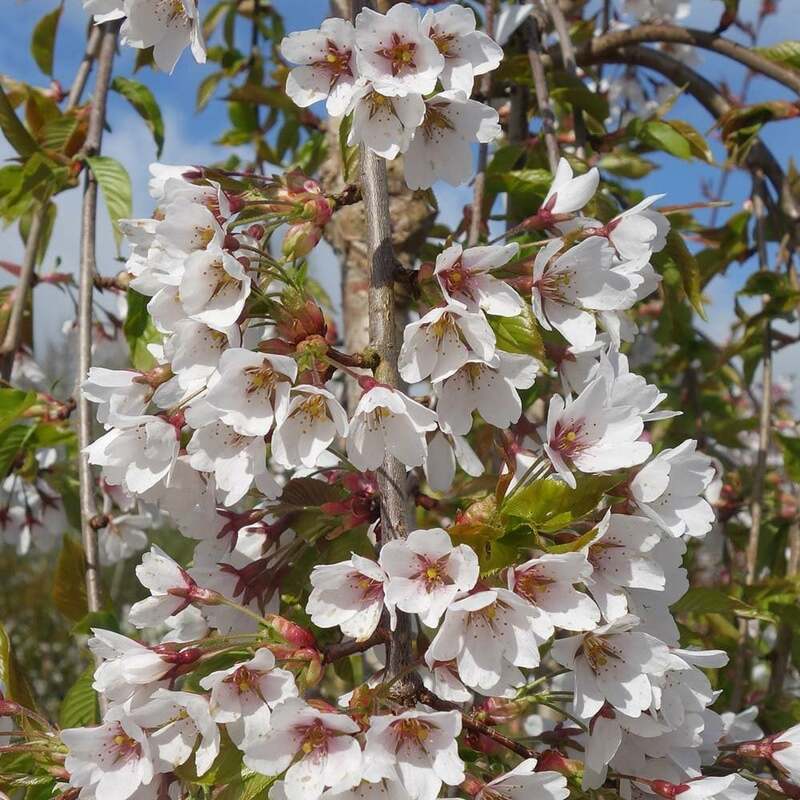 This Weeping Yoshino Cherry tree produces rounded clusters of single white, sometimes blush, flowers in March-April that have a delicious almond-like fragrance. The pendulous branches are covered in bronze new foliage which turns to dark-green and then develops attractive, fiery autumn colours. This Cherry Blossom tree will grow to 4 x 3 metres in 20 years and so is well suited to small spaces. Pollution tolerant, Shidare Yoshino will do well in urban areas and is suited to most soil types except wet or shallow chalk soils. A lovely, small garden tree with flowers that are less blousy than some of the other Prunus varieties, but equally as impressive making it an ideal feature tree. Our pot grown Weeping Yoshino Cherry trees can be planted at any time of the year. Choosing a location away from strong winds protects the blossom display. Start by removing weeds and grass within a metre of your desired planting hole. Dig a square hole as deep as your root mass and approximately 1.5x as wide. To help the tree establish more effectively, sprinkle root grow in the hole. Remove the pot, gently loosen the roots and place into the planting hole. Mix 50% of the original soil with 50% compost, fill in the hole and firm around gently. Avoid banking the soil up around the collar of the tree. We recommend planting Weeping Yoshino Cherry trees (except multi-stem forms) with a stake and tie kit to ensure the roots are well anchored - instructions are in the planting guide. When planting Weeping Cherry trees in spring or summer, water well for the first few months. Increase watering if there are extended periods of hot or dry weather. When planting in autumn, you may only need to water a little. See Irrigation kits. Although it is possible to simply leave your weeping Weeping Yoshino Cherry tree to its own devices, weeping varieties react much better to being heavily pruned in the first few years. Pruning should be carried out in the dormant season, removing any branches growing upwards or straight down. A tip for pruning weeping Cherry trees is to always prune to an upwards facing bud.